Many of us grew up with the familiar red box with the smiling “maid” holding a basket of grapes on the front. Sun-Maid Raisins are snacks that have effortlessly stood the test of time, still popping up in lunch boxes (or lunch bags), trail mixes, and other convenient eats to this day. Not a raisin eater? Well Sun-Maid offers more than just raisins. Everyone has tried dried fruit, but Sun-Maid products are always in-season and perfect as a snack while traveling or shopping. Kids also love the sweet taste of the fruit, and they don’t even realize they’re getting all the health-benefits of the fiber and anti-oxidants in the dried fruit! 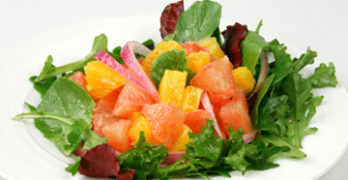 You can eat them straight out of the bag, or incorporate them in numerous recipes. Mix up your own batch of a granola mix with your favorites cereals, nuts and Sun-Maid dried fruits, pack your own 100-calorie packs for the long trip home, or make this quick and easy Holiday Gift Jar to take over to a friend’s house. I feel like Sun-Maid is a household name. I know that as a kid, I used to love raisins (or so I was told.) As I grew older, I transitioned from raisins to dried apricots (with a brief dabble into prunes) and now I’m getting back into raisins. One thing that has been consistent between my dried fruit phases has been Sun-Maid. When it comes to raisins, I honestly can’t even think of another brand that makes raisins. Is there one? For now, let’s just say that Sun-Maid is my go-to brand for raisins. Whether it’s snacking on their yogurt covered raisins or using raisins for trail-mixes, I always find the raisins to be perfectly chewy with a hint of sweetness. 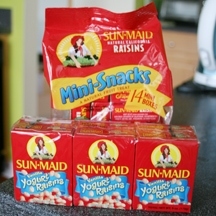 Sun-Maid raisins come in larger bags or boxes, or cute little boxes that are great for snacking on the go. If you want a fun twist on the traditional raisin flavor, I suggest you try out their Vanilla Yogurt Covered raisins. 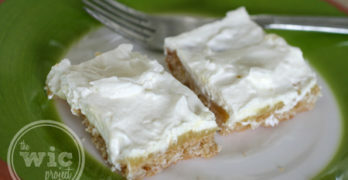 The 100% natural raisins are coated with a vanilla yogurt that gives it a subtle, creamy flavor. If you’re looking for another fruit to snack on, then you can also try Sun-Maid FruitBits or Sun-Maid Mediterranean Apricots. 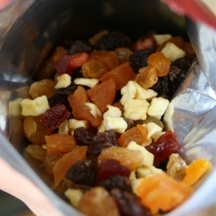 Sun-Maid Fruit Bits provides a full serving of fruit in just a quarter cups serving. Given that the quarter cup would include raisins, apples, apricots, peaches, plums, and cherries, that isn’t too suprising. That’s a whole lot of tiny dried fruit morsels in this one package. 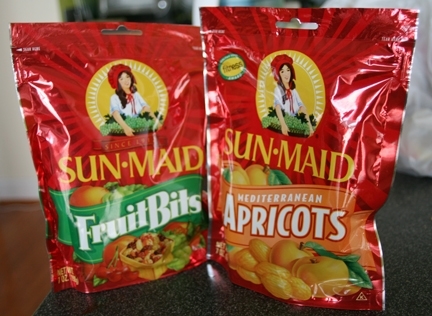 Sun-Maid suggests that you can use Sun-Maid Fruit Bits to top your desserts or cereals or for baking, but I enjoyed snacking on the bits right out of the bag. Yes…I might target some fruit bits more than others, but we all have our favorites, right? Finally, let’s talk about the Sun-Maid Mediterranean Apricots. First, these things are huge. Some other dried apricots are super small…like the size of a quarter. These apricots were almost the size of my thumb. And even though it’s considered a dried fruit, I still thought they had a ton of juicy flavor. Whether it’s the traditional dried grape – aka raisin – apricots, apples, or another dried fruit, Sun-Maid is one of my trusted brands for providing great-tasting and healthy fruit snacks.